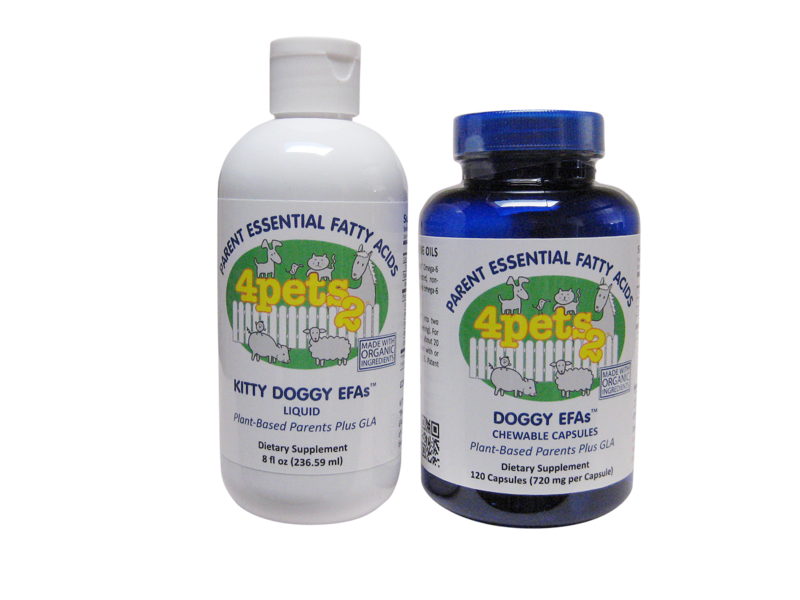 4pets2 Parent Essential Fatty Acids, A Highly Improved Ratio! 4pets2 Kitty and Doggy EFAs promote a highly improved ratio consisting of more parent Omega-6 than parent Omega-3 and no supra-physiologic overload of EPA or DHA that fish oil and other blends often contain. Evening Primrose Oil content in the 4pets2 formula is utilized for its important inflammation-fighting GLA. Most 3-6-9 EFA blends don’t contain Evening Primrose Oil (EPO). And, those that contain EPO contain very little. 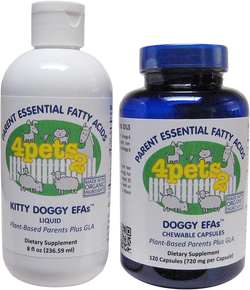 4pets2 EFAs in liquid and chewable capsules contain Parent Omega-6 and Parent Omega-3 EFAs in their natural, undamaged forms. This dynamic, scientifically advanced blend of plant-based parent essential oils is ideal for your pet’s health in many ways. * One can feel the difference in the fur alone after 6 weeks! * Capsules and Liquid contain the same formula. Since cats won't chew capsules, the capsules are marketed for dogs only. Liquid is suitable for dogs, cats, and small animals including rodents. * One capsule is equivalent to 1/4 tsp of liquid.